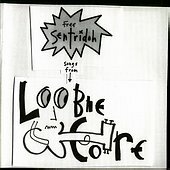 A collection of twenty-three lo-fi, primarily acoustic guitar and assorted noise songs from Folk Implosion/Sebadoh front man Lou Barlow, release under the name Sentridoh. Entitled Loobiecore, after Loobiecore.com, Lou Barlow's personal website, the record is a stripped-down, immediate look into the mind of Barlow. Barlow provides us with everything he has to offer, both physically and mentally, ranging in depth from the intimate WWJD?, Barlow's voice stripped away of any inhibitions as he struggles to deal with his own relationships in life. To the dissonant "The Devil +", a noisy contraption of tense acoustic guitar and various noises that send chills up your spine, as well as Barlow's voice, which is agitated and ready to take on anything. The blues-y "Choke The Rythm", the minimal folk-rock of "Up from the Well," another blues-y lo-fi number known as "Impulse", and the country of "None of Your Goddam Bizness" are prime examples of Barlow's ability to separate himself from his band identities and create something imperfect and raw. Something alive and breathing, charming with its flaws, and as open as a songwriter can get with his audience. One thing needs to be clear, this is not Sebadoh and this is not Folk Implosion. Fans of those bands will recognize Barlow's voice. The song elements and the structures are completely different, and those expecting anything remotely similar from Barlow will be sorely disappointed. Come with an open mind, though, and you will be rewarded. I'll give it a B+.